Discussion in 'Collecting and Card Price Discussion' started by Crystal Hikara, Mar 22, 2008. Yo, just wondering if the error I found on my Mareep card makes it worth anything. I realize POP7 has also just come out. 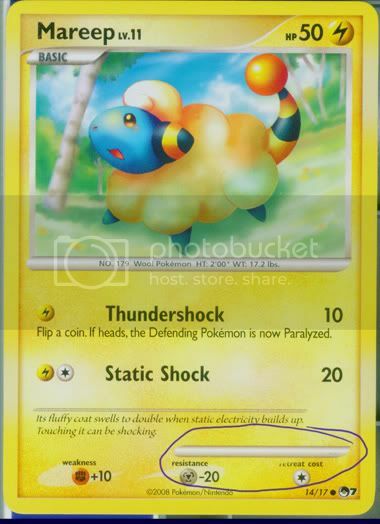 I digress; the Mareep card I have doesn't have the illustration caption on it above the resistance and retreat cost. As in, there are something of four dots near the end of the illustration bar where ''Atsuko Nishida' should be. Also, the first four letters of 'retreat cost' are slightly faded out. I'll make an attempt to get a scan, but my scanner isn't that great concerning colors and such. Can anyone get me an estimate, if it's actually worth anything and this is not a common error? In all seriousness, for the non-fanatics, I meant. If it's a rare error, it could be worth a lot. If it's common or all of them are like that, it wouldn't be worth much. Furrymuskrat: No signs of wear from angling the card in a bright light, to my knowledge. Card appears in just-pulled mint. So, I see anywhere from $2-$5, $5 being for a Mareep collector. Pokepop: Hence the second part of my question...; has anyone else who has the POP7 Mareep gotten this error card? I'm eager to hear from other people with the cards, especially because it's a common from the set, and I know that the POP5 Mew error was actually common. Edit: I apologize for the quality of the scan...*evil eyes the scanner* I circled the error area, as well.